How Do I Remotely Troubleshoot Someone Else's PC? Both Windows XP and Vista come with remote control programs called Remote Assistance, but they're too difficult for a novice to set up. As forum member smax013 explained on this question's original forum post, "you will need to know [the novice's] IP address...AND you will have to have Remote Desktop server function setup to run on her computer...AND you will need to configure any broadband router and/or software firewall on her end to allow the connection through to THAT specific computer." When a friend or relative calls with a desperate PC problem, and they lack the knowledge to accurately describe what they see on their screen, you don't want to walk them through configuring their router. One more thing: Remote Assistance doesn't come with the Home editions of XP or Vista--the ones novices are most likely to own. There are plenty of third-party remote control programs, and while most of them improve upon Remote Assistance, they're still not at the novice level. But when I expressed a dislike for all of them last year (see How to Be a Tech Hero...And Incredibly Popular), a reader going by the handle of Jeketem pointed me to one that I actually like: Skyfex. 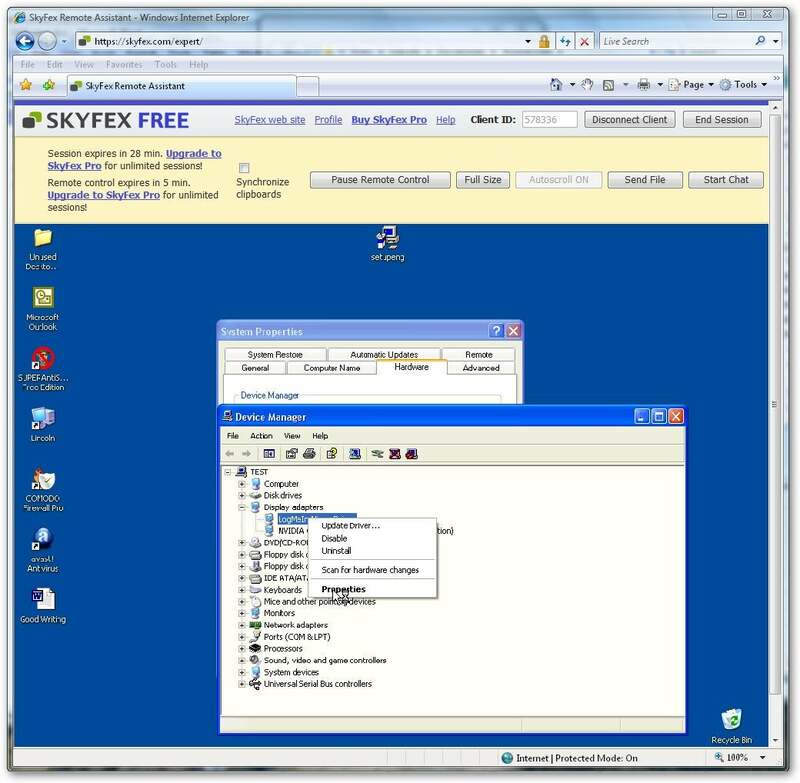 Skyfex lets you control a friend's PC (with their permission) to help them with their technical problems. your novice go to different pages on the skyfex web site (you need to sign up for a free account; the person you're helping doesn't). After the exchange of a six-digit number, you can see their desktop on your browser. When you click on "their screen," they'll see a shrinking red circle pointing to your target. Click the Request Remote Control button and, with their permission, you can control their computer. There are downsides. Skyfex only works in Internet Explorer. A single session can't run more than 30 minutes, and only five of those minutes can be used in remote control mode (these time limits disappear with the $30-a-month Pro version). The 'Synchronize clipboard' feature doesn't work...or at least it didn't work for me. But it's still far and away the easiest remote control system I've found. And for long-distance support, that makes it the best. Email your technology questions to answer@pcworld.com, or join the discussion in the PCW Answer Line forum.